Aaron Severson, editor of Ate Up With Motor, explains what happens when a bunch of tech-mad Frenchmen buy an Italian supercar factory and drink too much at lunch. This is the history of the space-age Citroën SM. —Ed. Note: We're sharing this piece for two reasons: One, we love the SM — and all Citroëns, for that matter — so much it hurts. Two, the car, introduced in 1970, turns 40 this year. Happy birthday, old friend. If you've read our histories of the Traction Avant and DS, you already have a picture of Citroën in its heyday: daring engineering, take-no-prisoners design, and a fearless contempt for popular opinion. The engineers and designers of Automobiles Citroën routinely took chances that would've left even the most maverick of U.S. auto executives quavering in mortal terror. To say that Citroëns were iconoclastic is like saying a Top Fuel dragster is quick — it's certainly true, but it lacks any sense of proportion. The surest evidence of just how advanced the DS really was back in 1955 is that fifteen years later, when Citroën launched a new model with most of the same features and hardware, it was still hailed as revolutionary. Even more remarkably, the Déesse was originally intended not as an exotic sports car or an executive limousine, but as a family sedan. The "Goddess" had disc brakes and fully independent suspension at a time when Ferraris and Rolls-Royces still had drum brakes and live axles. (In fact, Rolls was later forced to license Citroën's self-leveling suspension, being unable to concoct anything as effective on its own.) By the conservative standards of conventional automotive product planning, Citroën's approach was utter madness, and it undoubtedly limited their products' appeal to more timid shoppers. If the DS was a family car, what would Citroën concoct if it really did try to build a luxury GT? Buyers shopping in that rarefied but profitable class tend to be more intrigued than offended by the unusual (or even the outright bizarre), if it seems like it will wow the neighbors. They're also more willing to pay a premium for exotic specification; an important detail, since extravagant specifications tend to push the price tag well beyond the level of proletarian transportation. That affluent market was the target for the SM — one of the last, and certainly the mightiest, of classic Citroëns. The most conventional aspect of the SM is its transmission. Most had a new five-speed manual with a conventional clutch (fortunately not the DS's peculiar semi-automatic four-speed). A Borg-Warner three-speed automatic became available later in the model run. The automatic added about a second and a half to the SM's 0-60 mph (0-97 kph) time. The DS was many things, but it was not quick. Outright speed had never been a Citroën priority, but critics generally agreed that the engine was the DS's weakest link, and more than a few pined for a smoother, stronger engine. British race builder Connaught had already offered a number of souped-up conversions of Déesses and Idées, and it's surprising that the factory was so slow to follow suit. Indeed, Citroën chief engineer Jacques Né had been lobbying for a more powerful DS for some time before the SM project was launched. The big priority at Citroën in the mid-sixties, however, was not on enhancing existing models, but on expansion. Chairman Pierre Bercot was confident in the continued viability of the DS and the 2CV minicar, but there was a yawning chasm between them in price, which unfortunately represented the meatiest part of the European market. The Déesse, meanwhile, was a viable competitor for cars like BMW and Jaguar in terms of luxury and roadability, but it didn't have the performance to qualify as a true prestige car. To address this shortfall, Né's concepts of a more powerful DS evolved into a new model, a top-of-the-line flagship, the ultimate Citroën. There was a certain amount of national prestige in the offing; France hadn't really had a credible offering in the grand routier class since Delage, Delahaye, and Bugatti faded away after the war, leaving the field to the British, the Italians, and the Germans. Not only would such a car be a feather in Citroën's cap, it would restore a certain honor to the French auto industry. The plan was for the SM to use much of the hardware already developed for the Déesse, but it would need a new engine — Citroën engineer Walter Becchia had continued to work on six-cylinder designs since the failure of the flat-six originally planned for the DS, but those designs had come to naught. Pierre Bercot turned instead to the source of many fine GT engines: Italy. The hood scoop, which incorporates Citroën's distinctive twin-chevron emblem, feeds the ventilation system, not the engine. The Maserati V6 under the hood originally displaced 2.7 L (163 cu. in. ), making 170 net horsepower (127 kW) with three two-throat Webers. In January 1968, Citroën purchased a controlling interest in the Italian sports car manufacturer Maserati. The acquisition followed the absorption of the French automaker Panhard and the truck manufacturer Berliet, all of which was financed by selling a 26% stake in Citroën to Fiat. In short order, Bercot set Maserati to work designing a V6 engine for the SM. The engine project was a daunting endeavor because of its stringent requirements: the new engine had to be exceptionally compact and lightweight; it could displace no more than 2.8 liters (171 cu. in. ), a threshold beyond which French tax laws became too onerous, even for a luxury car; and it needed to be ready in only six months. The project nearly led to a mutiny among the Italian engineers, who didn't take kindly to the demands and arrogance of their new French masters. Amazingly, Maserati chief engineer Giulio Alfieri had a design ready in a matter of weeks, although it involved some compromises that later proved troublesome. Most of the rest of the car's engineering was familiar, to Citroën engineers, if not to the rest of the world. Suspension was largely the same as the DS, refined to eliminate a few of the Déesse's foibles and to suit the SM's more sporting intent. Brakes, too, were similar to the DS, although the SM got discs at all four wheels, reflecting its greater speed potential. Front-wheel drive was likewise carried over, as was the high-pressure central hydraulic system, which no other automaker other than Mercedes had dared to imitate. As before, the hydraulics powered suspension, brakes, and steering. The latter, dubbed VariPower, was now provided with a much faster ratio, a self-centering action (if you cranked the wheel around with the engine running, it would return to the center by itself), and a novel speed-variable system that reduced steering assist at higher speeds. The SM was a big car for a contemporary European coupe. It was a bit longer overall than the DS, although its wheelbase was some 7 inches (175 mm) shorter. It was also about 300 pounds (135 kg) heavier than the DS. Like its sedan predecessor, the SM used unitary construction, although it omitted the Déesse's unusual bolt-on fenders in favor of fully stressed steel body panels. In the Citroën fashion, it was designed for aerodynamic efficiency, the company claiming that its drag was 25% lower than the already-slick Déesse. That was unlikely (the most reliable figure we've found for its coefficient of drag was 0.336, still a highly creditable figure), but it was still among the most streamlined cars on the road. The chopped-off "Kammback" tail was the most controversial aspect of the SM's styling. It was there purely for aerodynamic reason; the abrupt drop-off was intended to provide most of the aerodynamic effect of a teardrop shape, without the extra length and otherwise useless mass of a long, narrow tail. Honda's first-generation Insight hybrid also used a Kamm tail and skirted rear wheels, for much the same reasons as the SM. The Insight's coefficient of drag is only 0.25, among the lowest of any modern production car. When the SM made its debut at the Geneva auto show in 1970, the motoring press was once again blinded with science. The SM's hydropneumatic suspension, though not much changed from the original DS in principle, was still a wonder. Front-wheel drive remained novel in those days, particularly for a car of this size and power. The uncanny self-centering, variable-assist steering, with only two turns from lock to lock (more than 50% quicker than most modern cars), met even greater wonderment. Added to the cachet of its Italian engine — with the Maserati trident proudly adorning each valve cover — the SM emerged as an impressive achievement. The front end of a U.S.-market SM, with only four sealed-beam headlamps, looks somewhat vacant compared to its European counterpart. Even if it had been as conventional as a '55 Chevy under the skin, the SM would have knocked 'em dead in Geneva based on its looks alone. Primarily the work of Citroën styling chief Robert Opron, it was as visually confrontational as running through the Republican National Convention in full leather-fetish gear. Its only vaguely orthodox aspect was its long-nose/short-deck proportions, dictated more by the front-drive layout (which still placed the transmission ahead of the engine, like the Traction Avant) than any concern for contemporary fashion. That it was sleek, bold, and imposing, no one could argue; whether it was attractive was another question entirely. Many contemporary observers liked the imposing nose of the European car, which had no less than six Cibié halogen headlights, the inner pair swiveling with the front wheels. The angular, chopped-off tail — an aerodynamic feature known as a Kamm tail — was less favorably received, many calling it busy and awkward. Two things were beyond question: first, that the SM was as provocative as any of the edgy show cars then emerging from Italy; and second, that it could be nothing other than a Citroën. The SM was quite an expensive car, starting around 52,000 FF in France (around $9,500 at contemporary exchange rates). In the U.S., its price started at a sizable $11,800, which was about $2,000 more than a well-equipped Cadillac Eldorado. British buyers were soaked for £5,200, including purchase tax, equivalent to around $13,000, and Citroën did not even deign to offer a right-hand-drive model. Such prices put the SM in the realm of the BMW 3.0 CS, Mercedes 350SLC, Porsche 911, and even Ferrari's V6 Dino 246 — heady company indeed. The SM is quite a bit bigger than its most direct contemporary rival, the BMW CS coupe — it's 9 inches (229 mm) longer, 6 inches (152 mm) wider, and around 200 pounds (91 kg) heavier. At 52.1 inches (1,323 mm) tall, it's still quite low by modern standards, although interior headroom isn't bad, even in back. Even by the standards of its time, the SM's objective performance statistics were merely adequate. Although the Maserati V6 bristled with performance feature like dual overhead camshafts, hemispherical combustion chambers, and a trio of two-throat Weber carburetors, it produced an unexceptional 170 net horsepower (127 kW), against which was leveled the big coupe's all-up weight of more than 3,300 pounds (1,500 kg). 0-60 mph (0-97 kph) took around 8.5 seconds, certainly not bad, but no threat to American muscle cars or Italian exotica. Top speed was more impressive; thanks to the aerodynamic profile, the SM could approach 140 mph (225 kph). Its brakes were strong enough, but not dazzlingly powerful, nor did its modest Michelin 195/70R-15 radial tires offer overwhelming levels of grip. The point of the SM, however, was neither blazing speed nor Fangio-like cornering antics. Its métier was effortless, high-speed cruising for four, with the imperious disregard for rough roads that had become a Citroën hallmark. Although the SM's hydropneumatic suspension was set firmer than that of the DS, its ability to smooth out choppy pavement remained uncanny. The German and Italian GTs may have had more composure over 100 mph (161 kph), but they were far less comfortable at saner velocities than was the Citroën. Only Jaguar's XJ6 sedan truly rivaled the SM's unique combination of poise and plushness. The SM's handling was almost as controversial as the looks. Some sports cars of this era, particularly Ferraris, thrived on a certain well-placed aggression at the controls, but manhandling an SM was sheer folly. The VariPower system and self-centering action did at least keep you from careening into the weeds if you sneezed at highway speeds, but the lightning-fast steering ratio and total lack of feedback required your full attention in any hasty maneuver. The brakes, operated not by a conventional pedal, but by the Déesse's peculiar, mushroom-shaped rubber button, also demanded a careful touch. Once you got used to it, you could cover ground at a tremendous pace, but driving an SM well meant mastering a new, more delicate set of driving techniques. Despite all those caveats, initial sales were encouraging, particularly given the SM's substantial price tag. It took a few months after the Geneva debut to get the SM in full production, but close to 5,000 were sold in 1971, more than 4,000 the following year. Alas, the SM soon developed a reputation for reliability problems, owing not so much to the complex suspension (which was reliable enough if well maintained, although expensive to repair), but the Italian engine. The Maserati V6 was, as we mentioned, a sophisticated engine — all-aluminum, DOHC, and so on. It was admirably compact and impressively light, at only 309 pounds (140 kg). Sadly, it was compromised somewhat by its hasty design. In order to meet the Citroën deadline, Giulio Alfieri's engineers had created the V6 by essentially trimming two cylinders off of their existing V8 engine, shortening the stroke by 5 mm (0.2 in.) to meet the displacement requirement. Like the V8, the angle between the cylinder banks was 90°, fine for an eight-cylinder engine, but resulting in an uneven firing interval in the six. (The ideal angle for a V6 is 60°, but that would have required a completely new design, not sharing the tooling of the V8.) The result was vertical shaking and a rather lumpy idle, not unlike the early Buick V6, which had the same problem. In a rough-and-ready sports car, it might have been fine, but it lacked the kind of pinkie-in-the-air refinement the SM deserved. Like the DS, the SM had Citroën's unusual single-spoke steering wheel, which helped to kept the wheel from obstructing the gauges. Had the engine been reliable, it might not have been so much of a problem, but the V6 soon became the SM's albatross. Period reviewers were widely varied in their descriptions of the engine's sound quality; some found it quiet, others noted a decidedly raucous character and some alarming noises. Those worrisome sounds were a forewarning of a serious problem: weakness of the complex timing chains that drove the V6's overhead camshafts. Many owners found, to their great cost, that ignoring those sounds could have expensive consequences. The oil pump and ignition system were also failure-prone, particularly in cold weather. On U.S. cars, with their EPA-required air-injection pumps, the exhaust manifolds tended to become red hot, causing a rash of under-hood fires. Had the factory addressed these problems in a positive way, they could have been sorted fairly easily, but Citroën reacted with typically haughty arrogance. Buyer confidence was shaken, and SM sales slumped. In the winter of 1973, OPEC pulled the rug out from under the whole market. In the wake of the Yom Kippur War, Middle East oil producers embargoed deliveries to the West, resulting in widespread shortages and a brief return of fuel rationing. The crisis had a severe impact on the sales of big, thirsty cars — the rich traditionally care little for the cost of fuel, but when it can't be had at any price, even affluent buyers exercise restraint. (Ironically, the SM was considered frugal by American standards, but Citroën left the U.S. market after 1973, concluding that American sales were too low to justify the cost of federalization.) SM sales tumbled from 2,619 in 1973 to only 294 for 1974. Citroën, meanwhile, was bleeding money. The company had lost $110 million between 1968 and 1970, mostl of which was attributable to the costs of developing the SM and the new, compact GS. 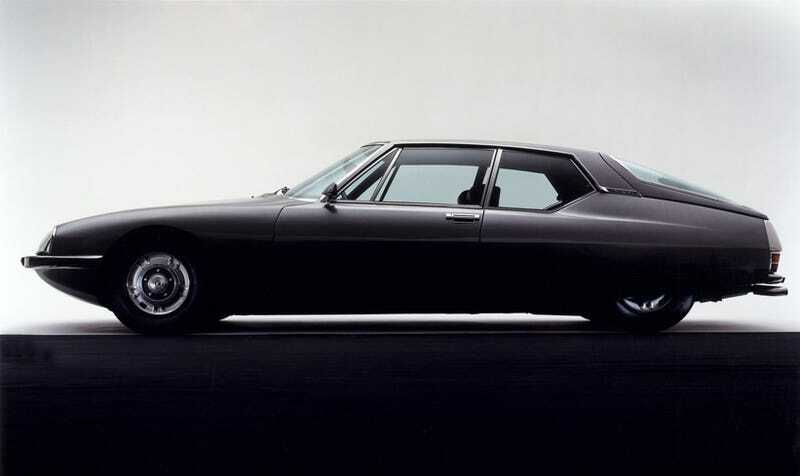 The SM had been an expensive project whose investment was never going to result in high-volume sales (although there had been idle rumors that a four-door, four-cylinder version might eventually replace the DS). To make matters worse, Citroën's latest leap, the Wankel rotary engine developed for the GS Birotor, had proven to be a costly debacle. FIAT, smelling catastrophe on the wind, soon relinquished its stake in the company. By the end of 1974, Citroën was bankrupt, leading to a government-imposed merger with rival Peugeot, completed in 1976. One of the first casualties of the merger was Maserati, of which Citroën divested itself in May 1975. Another was Robert Opron, the SM's designer, whose tastes were far too outré for the new management. (He went on to Renault, and eventually to Fiat.) The SM was canceled, although its V6 engine and transmission survived in the Maserati Merak. Only 115 1975 SMs were sold before the curtain came down, bringing total production to 12,920. The demise of the SM (and the Déesse, which also ended production in the spring of 1975) marked the end of an era. Subsequent Citroëns, like the Cx, BX, and Xantia, were still quite eccentric, but they became progressively more vanilla as Peugeot asserted its control. More than almost any other car — and even more than any other Citroën — the SM remains an acquired taste, and a demanding one, at that. A modern Honda Civic sedan would beat it like a gong in almost any objective measurement except absolute top speed. But such comparisons miss the point; the SM is not so much a car as an alternative lifestyle. Nearly every aspect of owning and driving one, from tire-changing to driving over wet, slippery roads, requires a different approach and a different way of thinking than any ordinary car. Whether the Citroën way is better is a matter of preference, not statistics. In a certain sense, it's not unlike contemporary Ferraris, even though the character of the cars themselves could not be more different. As with Ferraris, Citroën owners must adjust to the unique demands of the car, not the other way around; if that's a problem, they might as well sell it and buy a Toyota. Our sources for this article included Julian Marsh's superb SM page (Julian Marsh, date unknown, Citroënët, http://www.citroenet.org.uk/passenger-cars…, accessed 27 August 2008), with additional information from Wiljan Cats' Citroën page, (date unknown, Cats-Citroën, http://www.cats-citroen.net/home.html, accessed 30 July 2008); and Niels Heilberg, "Citroën Faces" (date unknown, http://www.geocities.com/MadisonAvenue/…, accessed 1 August 2008). For a more complete list of sources, see here. Aaron Severson is the editor of Ate Up With Motor, a site that provides in-depth history and commentary on interesting cars and the people behind them.